Whether from whiplash, concussion or direct blow, or vacuum/forceps extraction from birth, injuries to the head can cause a host of unusual symptoms. 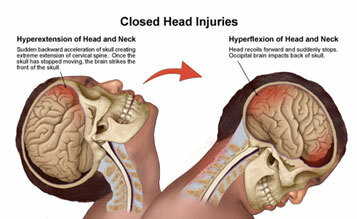 It’s important to note that you don’t have to hit your head to experience a concussion or head trauma. What’s more is that left untreated, you may have residual symptoms from a trauma you experienced years ago. The type of injury, as well as severity of injury will determine the signs and symptoms. The goal of treatment is to get pressure off of the cranium. When there is compression on the brain this can cause a decrease in blood flow as well as cerebro-spinal fluid CSF, which is vital to our function. Cranial therapy can help to regain circulation, and decrease pressure on the brain, which may help alleviate some of these symptoms. Additional work with other providers might be necessary depending on severity for cognitive and/or visual abnormalities.